Food blogging is a hard job. It gives me a reason to go out for meals but it also takes a lot of money. Sometimes I am in the mood for something easy on the wallet. Today was one of those days where I wanted to eat cheap without the hassle of cooking. I decided to go to a friend's personal favorite, Steel Wheels. 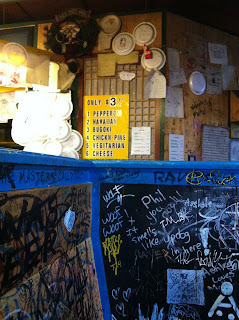 Steel Wheels Pizzeria is an interesting restaurant to say the least. When you enter, you will immediately have one of two reactions: you'll be charmed by its uniqueness or completely turned off. 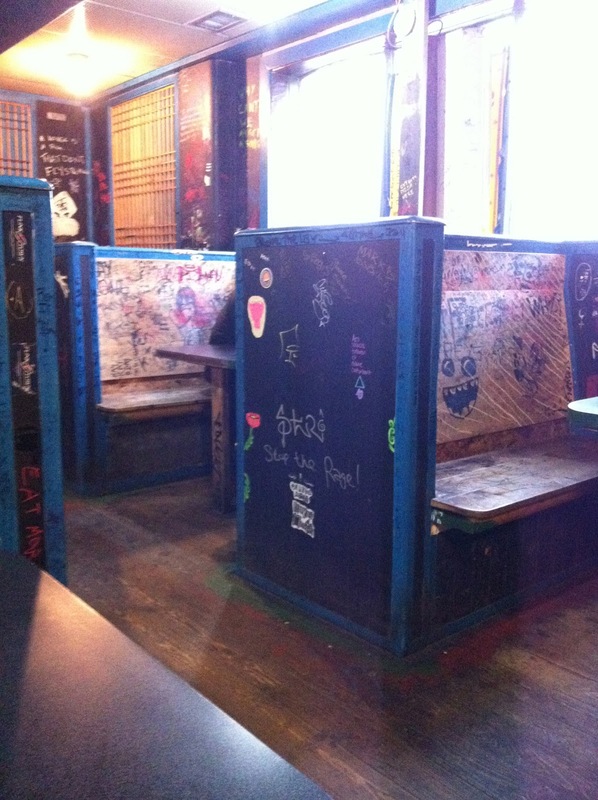 The "decor" consists of booths with wooden benches, and there is not a single surface without graffiti or just plain doodles from previous customers. I have a feeling that Steel Wheels just left the charming decor from whatever establishment preceded it and built around it to save some money. It's not for everyone, especially neat freaks or germophobes (I'm sure Steel Wheels isn't actually dirty, but it sure gives off that appearance). 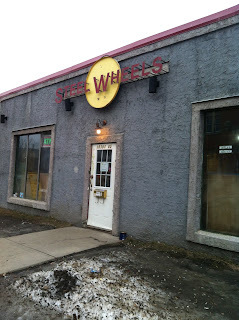 If that describes you, you'll be pleased to know that Steel Wheels also offers up cheap beers to help you care a bit less about your surroundings. 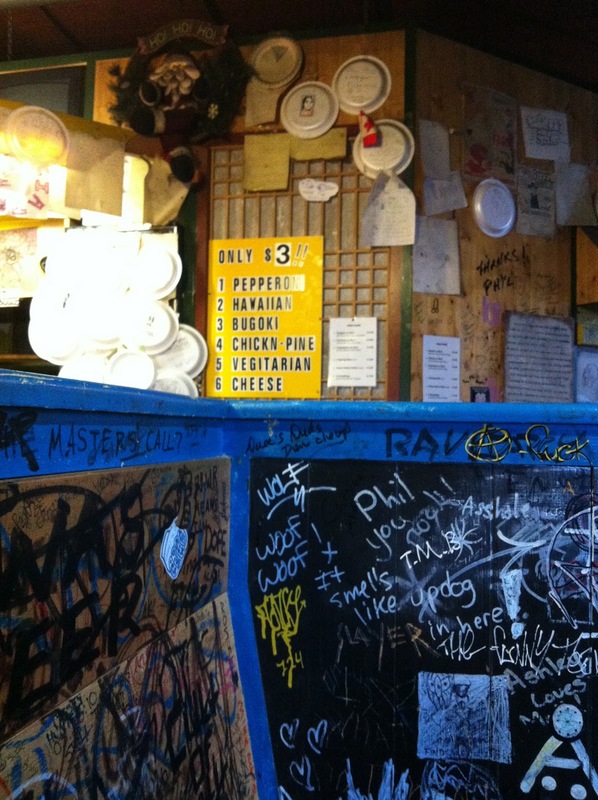 As the name speaks for itself, Steel Wheels Pizzeria is best known for its pizza. But I'd like to think that they should be known for something else. Run by a Korean family, this restaurant also offers a few dishes from their own culture. I love Korean food: it's spicy, has pickled vegetables and uses tasty meats. 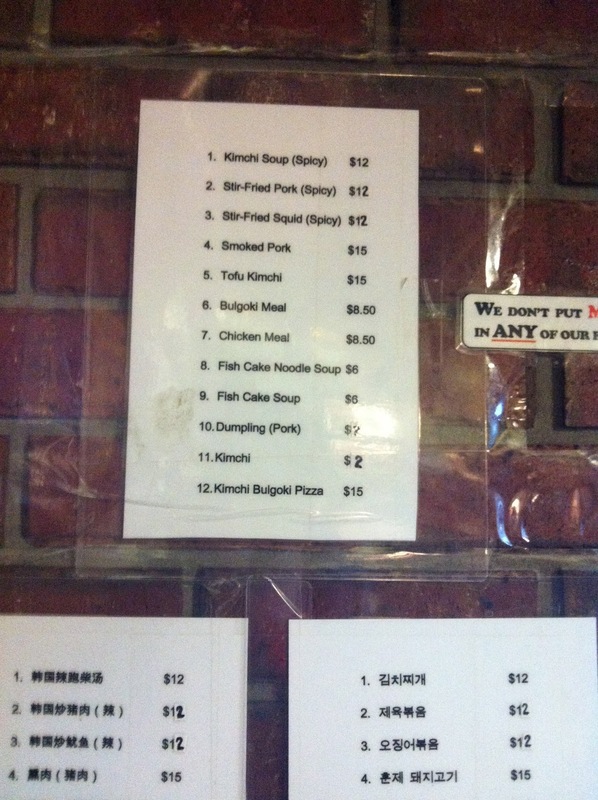 Since my last visit, it appears Steel Wheels has updated their Korean menu. 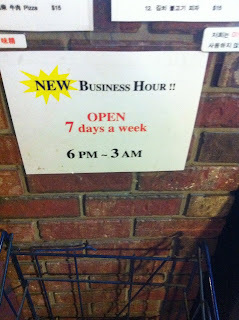 It used to be handwritten and posted on the back of a pillar. 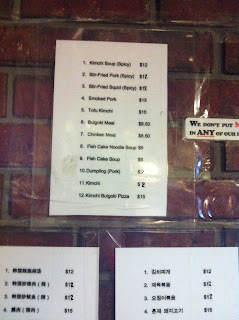 The menu is quite simple: there are only 12 Korean dishes and six types of pizza. 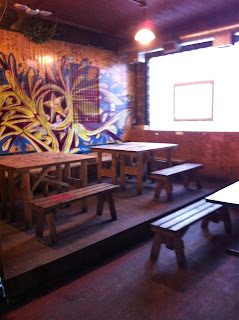 I've had both types of food at Steel Wheels, and I much prefer the Korean food. On this visit, my friend and I decided on the spicy kimchi soup and the stir fried squid. You place your order at the cashier and then once your food is ready, they call you to come pick it up and you bring it to a table of your choosing. Both dishes came out relatively quickly (within 10 minutes of ordering). The stir fried squid had chopped broccoli, onions, and mushrooms topped with sesame seeds and covered with gochujang sauce. Gochujang is a fermented condiment made from red chilies, rice and soybeans. I compare it to ketchup in Korea, basically something that is used in many ways. This dish was SUPER spicy. 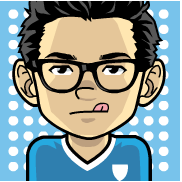 Really, the main and only flavor that I could taste was hot. My mouth burned with each bite. The squid and fresh vegetables were cooked well but the dish was way too spicy for me to enjoy. The kimchi soup came out bubbling hot with two bowls of white rice. Now for $12, that's what I call a great deal! Alone this was literally enough food for two people. This was definitely the best dish I have tried at Steel Wheels. The soup contained big pieces of firm tofu, lots of kimchi (fermented cabbage) and slices of fatty pork. The soup was a bit spicy but there was a nice rich texture from the tofu. The fatty pork slices added a nice salty and succulent flavor. I could BARELY finish my huge bowl of rice. Did I mention they also sell pizza here? You can get two relatively decent sized slices for only $3. Not a bad price but there is a very limited selection of six types (see above) including bulgogi. Bulgogi is a Korean dish made up of grilled slices of beef marinated in a combination of soy sauce, garlic, onions, sesame oil, mushrooms and pepper. Unfortunately, the pizza didn't have a lot of bulgogi flavor, or if it did, it was smothered by the giant layer of cheese that covered it. To even finish the pizza, I had to drench my slice in ranch and hot sauces. The crust is of the frozen variety you might buy at the grocery store - thick, doughy, and altogether unimpressive. Although cheap, I have definitely had MUCH better pizza. You do not have to worry about finding a parking spot as they have an adjacent parking lot. Steel Wheels is a "cheap eats" restaurant no matter what you order, but it's definitely not for everyone. I think of it more as a poor student joint, as the food can be subpar but so cheap you can't complain.